DSLR camera as also the other high-value goods, routinely and periodic must be care and maintaining. Perhaps maintaining is better the than repairing. Special even for DSLR camera otherwise a maintenance regularly, hence the repair possible not way out but have to be replaced. Perhaps this matter is very harm because have to expense which big relative, where than buying for the bought better-ruined shares replacement accessories which not yet been owned or which better qualities. Quite a lot people says that DSLR camera has to be keeping in special place/storage, which I think to the opinion is imprecise, because fund and place improvidently, and another taking cheap and easier i.e. by periodic and routine care and maintenance. a. Read the manual guideline book, some digital cameras have a special handling and maintenance, and in certain conditions, which can degrade the quality of the camera, read the manual is necessary for your camera remain durable. b. Disassembled camera each time it is used and cleaned one by one from dust, water, oil, sweat, etc..
c. Avoid use in extreme conditions such as temperature is too high, too low, wet, exposed to extreme vibration or shock, in a strong magnetic field environment, falls, exposure to sunlight for a long time, dust or sand crashing due to high winds. d. Use a UV filter on shooting outdoors, in addition to reducing the impurities also protects the lens from excessive heat and light. e. Do not expose the lens to sunlight or the light that emit heat directly. Heat from the light toward the lens can damage the lens. If the photograph to include the light source (sun, light flares, etc..), Then immediately after photographing switch the camera lens from the light source and camera lens so that the temperature can drop back, then photographed again if still necessary repetition. g. Remove the battery if the camera is not use for a long time and keep it carefully. a. Do not store the camera in one place (may be cabinets, boxes, or other enclosed spaces) equipped with incandescent lamps. Incandescent lamps have a heat emitting properties, in addition to light, which can cause an increase in room temperature and can result in light-tight system that is in the camera, such as rubber seals, velvet, etc. could be affect such as shrunken, loose or even damaged. Because of light sensors either are available on the camera or the lens cannot function properly or does not fit with what we want because there are additional light was not invited in through the crevices of the broken earlier. b. Do not store the camera mixed with clothing. In general, storage closets or clothes tend to be damp and put camphor. Camphor vapor can damage the camera lens. c. If possible, store the camera in an air-conditioned room. Air-conditioned room has conditioned a humidity of less than room without air conditioning. d. Use container made of plastic or polymer material that can closed tightly like container production of Tupperware, Lion Star and other, customized store space requirements and availability of funds. e. Noteworthy is the ability to check the closure of the container and then open the lid. This container has strived leakage rate as low as possible or the highest level airtight as possible. f. Enter the silica gel in the container. Silica gels absorb water content in the air or the air humidity in the camera storage container. Silica gel can be purchase retail or store bags in chemistry or pharmacy items such as Kimia Farma. The indicator of active silica is colored blue or pink color saturation. Place the silica gel is in a small container, can be a camera film container, or other small containers, leave open (not closed) or if the fear of spilling a small container can be closed remains given the small holes that can be made with needle in this small container . The important thing is the storage container of silica gel to direct contact with air in the camera storage container, so the air humidity can be absorbed. Indicators of silica gel was saturated (not working anymore) if it changes color from its original color, for example, if initially blue or pink in color saturation and then had turned into a pale blue or pink (normal conditions its active limit of about 2 months). If it is so then replace it with a new silica gel. If you want to save money, which already saturated silica gel can be reusing by silica gel grilling on the stove before being use again. By roasting, the trapped water can be force out a yawn. The indicator silica gel has to be re-used (active) if the color changed again (dark blue / blue saturation). Wait until cool and input back to its original place. Media for grilling can from the pan to make bread. This process can be repeating several times without compromising the ability to absorb water in the air. a. Read the user guide for care and treatment in the book instruction manual, there are some digital cameras that have a special treatment. b. Fingerprints on the lens are cleaning with lens tissue and aid the natural steam of the mouth, clean it with rubbing slowly. 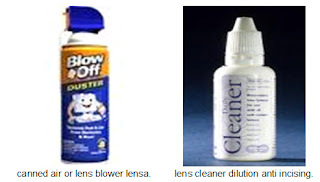 c. Grease and sweat attached to the lens is cleaned with a dry soft cloth (flannel) or with a little lens cleaning fluid. Avoid wearing a coarse cloth, as this can damage the outer layer of the lens. d. In a camera sensor using “canned water” or a special blower lens. But if you have a dust removed facilities at DSLR camera sensor, like as “Low pass filter” on the Canon, “supersonic wave filter” on the Olympus, “Dust removal system” on the Pentax, “Sensor shake system on the Sony” or Integrated Dust Reduction System on the Nikon), clean them with a way of turning the camera body and open the window shutter mode with seniors at the position of "bulb" for window shutter is kept open while cleaning the dust. e. If a lot of dust or sticky on the sensor, clean with a blower or blower, such as canned water lens. f. If there is any dirt that remains sticky, then wipe with a special liquid cleaners, anti-scratch lenses.